On February 24, 1919, a group of women were arrested, and most were imprisoned in Boston’s Charles Street Jail, for protesting President Wilson during his visit to the Massachusetts State House and at a parade in his honor. 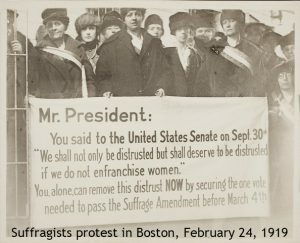 The protest was to lobby him to pressure the U.S. Senate to pass the 19th amendment before their March 3rd recess. The women arrested and jailed at this Boston protest were some of the many brave women who sacrificed much to secure the right to vote for women. 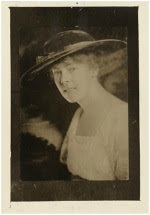 Katharine A. Morey, of Brookline Massachusetts, was an officer of the Massachusetts Branch of the National Women’s Party (NWP). She was the daughter of NWP organizer and state suffrage activist, Agnes H. Morey. Katharine worked as an organizer in the election campaign of 1916 in Kansas, and frequently assisted at NWP national headquarters in Washington, D.C. She and Lucy Burns were the first suffragists to be arrested for picketing at the White House and she served three days in jail in June 1917. After her arrest in Boston in February 1919, she served eight days in the Charles Street Jail. Betty Gram, along with her sister Alice, joined the women’s rights movement in 1917. Betty was part of a group arrested for protesting the treatment of Alice Paul in prison. After her release, she joined the National Woman’s Party as a national organizer and worked for the passage of the 19th Amendment. Betty, originally from Oregon, lived in Washington, DC, Connecticut, and Vermont, where she worked on behalf of the NWP. In February 1919, she also served time in the Charles Street Jail; the charge was violating a city ordinance. Josephine Collins is best remembered as an activist fighting for woman’s right to vote. 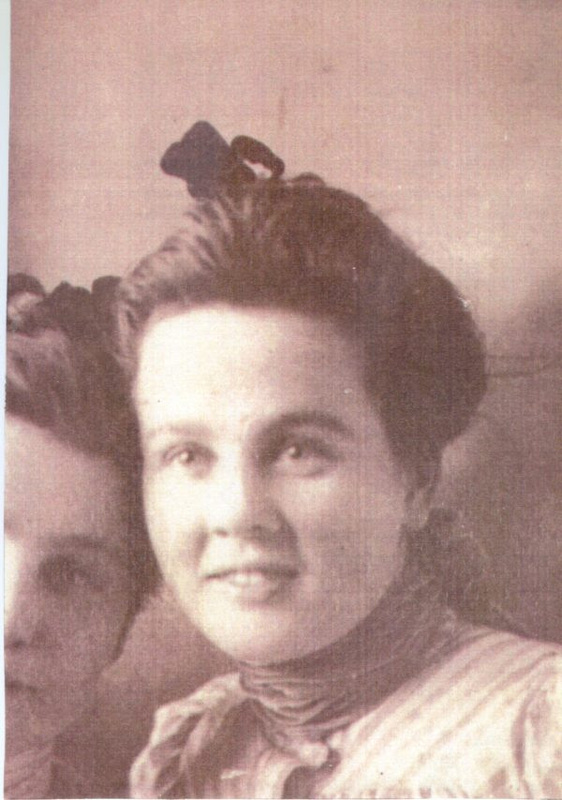 Born in 1879, she was the oldest daughter in a large Irish family that lived in Framingham, Massachusetts. Although she was a single woman and opportunities were limited, she found many ways to support herself. She was a successful businesswoman as the owner of a Tea Room, a dry goods shop, and her own Periodical Shop. In her later years, she worked as a bookkeeper for Babson College. Josephine was a member of the National Woman’s Party (NWP) founded by Alice Paul in 1916. 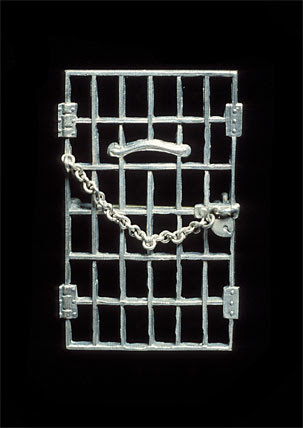 She received one of the Jailed for Freedom pins given by Alice Paul to 89 brave suffragists in December 1917. The original pin is part of the collection in the Framingham History Center. On February 24, 1919 when President Wilson was visiting Boston, Josephine attended the rally and protest demanding the passage of the suffrage amendment. She held a sign that read: “Mr. President, how long must women wait for liberty?” She was arrested along with 24 other women and taken to the House of Detention for Women. Josephine was part of the group that refused to give their real names or pay the five-dollar fine. This group was taken to the Charles Street Jail for an eight-day sentence. Much to her dismay, her brothers paid her fine and she was released before serving her full sentence. Camilla Gertrude Whitcomb, born in 1860, originally from Worcester, Massachusetts was a suffragist in her hometown and in Washington, D.C. with the National Woman’s Party. She was the Corresponding Secretary of the Worcester Equal Franchise Club, which was formed in 1913, and club’s President in 1915. For the NWP, she was chairman for the 4th Congressional District of Massachusetts. In November 1917 she was involved in a protest while the authorities were holding Alice Paul prisoner. Camilla was part of the group who marched to the White House; all were arrested. She was sentenced to 30 days in the Occoquan Workhouse in Virginia. These suffragists, both strong willed and persistent, never gave up throughout the struggle to obtain the right to vote. 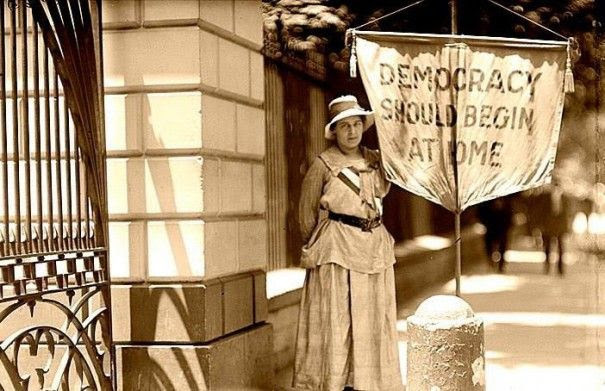 They serve as a lasting reminder that women’s voting rights did not come easy.